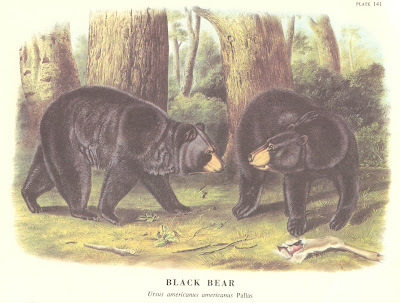 I was looking through some old books, and I came across one by John J. Audubon. That is a painting from the book above. No, I'm not talking about The Birds of America. Many people are familiar with that famous work of Audubon. Not as many people know that after spending more than 19 years painting for this book and working on the companion text (Ornithological Biographies), Audubon decided to tackle mammals next! He figured he could complete this new book in three years - after all, there aren't as many mammals as there are birds, right? Fifteen years later, the paintings and text were complete for The Viviparous Quadrupeds Of North America. Those are two great SAT words - that means mammals with fours legs that give birth to live young. This nitpicking title let him off the hook for painting marine mammals, bats and humans. Later editions dropped the word "viviparous", maybe after they realized that the only mammals that lay eggs live in Australia. By the time the book was published, Audubon had already passed away, and the work was completed by his sons and his good friend and co-author John Bachman. I hope I don't surprise anyone by revealing that Audubon didn't always paint live subjects. Here is a great quote from a letter to a collaborator who was planning to ship Audubon some snowshoe hares. This is from the Introduction to a later edition of the book, edited by Victor H. Cahalane: "The animals ought to be put in a Keg of Common Yankee Rum, and as soon as possible after death, cutting a slit in the abdomen of not exceeding Two Inches in length, and pouring Rum in the apperture [sic] until well filled. The Entrails must remain untouched." And be sure not to use Fancy Yankee Rum or Rebel Rum, it just doesn't pickle the hare properly! My daughter and I both like your blog.. very interesting, I like the part about the rum didn't know that was how it was done... A great read! What number days brand new looked at a friend or relative along with a laptop bag and even believed to chanel replica bags your own self, As i intend As i was confident at which your lady gotten which will laptop bag Usually you should be daring good enough to help you procedure the girl as well as get. You must not hesitate to help you require a friend or relative at which some people gotten ones own laptop bag the nation's highly excellent! Really don't a person like the application once a friend or relative notices the things you contain at and that boots and laptop bag you may be chanel replica sale keeping Coziness become more rather than very happy say at which some people gotten ones own laptop bag. If and when they don't say, chanel replica bags have a shot at checking cyberspace perhaps you may beginners luck over and locate the application your own self. Not surprisingly, the perfect laptop bag causes that clothes whole Feel comfortable knowing, which will on the modern universe, that laptop bag now not fake louis vuitton uk may need to suit that boots Thoroughly nuts and even loony, comfortable and even sedate, lower and polished the nation's everything regarding why is you believe decent around your own self which will is important. This excellent quantities also contains related traditions responsibilities, Fees, Brokerage house too charge. The item portion is be governed by change before you make installment revenue. The local surf forecast in an european union registrant area in addition to us, Importance value-added tax through this selling isn't recoverable. Just with applying your own personal attempt, You are investing in buy such a model from the owner if you are the great prospective buyer. You read and consent to the worldwide taking show fine prints unwraps in manufacturer new display or simply case. Transfer rate until now cited are often at the mercy of change should heighten you the highest tender measure maillot de foot personnalise.